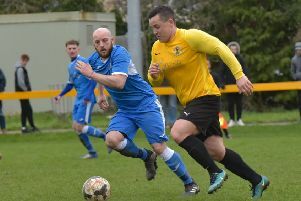 Leamington avoided another ignominious cup exit at the hands of lower-league opposition, with a man-of-the match performance from Tony Breeden sparing their blushes in this FA Trophy clash, writes Paul Okey. Witton were a level above their hosts throughout and were feeling a sense of injustice long before Anthony Dwyer popped up with an injury-time winner for Paul Holleran’s side. Referee Greg Rollason was the object of their ire after failing to send off Breeden early on in the first half for handling the ball outside the box and later awarding a penalty against them after Jack Edwards had been sent tumbling in the box. Nevertheless, the Northern Premier League side, who had beaten Spennymoor and FC United in the FA Cup earlier in the season, continued to play with remarkable verve in their bid for a third Conference scalp, seeing chance after chance slip by before Dwyer’s late sucker punch. Edwards glanced a third-minute header wide for the hosts who were second best for the opening 20 minutes as they struggled to contain their lively visitors. The burly Will Jones was proving a handful for Brakes centre-back pairing and he was an integral part of the visitors’ ninth-minute opener. Jones won the initial header and then, after getting the ball back, played an astute pass to release James Foley who swept the ball past Breeden and into the net. Jack Edwards was bundled over for Brakes' penalty. It was Foley who was central to the game’s major talking point, with the goalscorer racing on to a ball over the top and sending the ball goalwards only for Breeden to instinctively throw out an arm after racing from his area. The referee immediately blew for a free-kick but, with everyone expecting a red for the home captain, let Breeden return to his goal-line only to issue him with a yellow after the wall had been set. The resultant free-kick came to nothing but it was already looking like being another forgettable cup afternoon for Brakes, with an Edwards volley which ended up going out near the corner flag summing up their efforts in the opening half-hour. They were thrown an unexpected lifeline, however, when Rollason pointed to the spot after Edwards had been manhandled in the box as he looked to get on the end of a Breeden kick. Colby Bishop stepped up to send Greg Hall the wrong way in the Witton goal to restore parity. Celebrating Anthony Dwyer's late winner. Jones sustained a neck injury after a heavy fall in the box, with the striker replaced by Rob Hopley and, after the long stoppage, Brakes were able to wrest control from their visitors. Reece Flanagan’s finish failed to match neat build-up play from Leamington, with the midfielder’s strike clearing the Harbury Lane End, while Connor Taylor dragged a shot wide after the ball had ricochetted to him in the box. Tom Owens failed to get a decent purchase on his shot after Witton worked an opening on the edge of the Brakes area and in the final minute of injury time, Jamie Hood was unable to force the ball home after getting three bites of the cherry in an almighty goalmouth scramble. Home fans hoping Brakes would go on to underline their Step 2 credentials after the break were to be disappointed as Witton went on to dominate, wasting chance after chance. Owens produced a good turn in the box before curling a shot wide of the far post, while Foley was also off target after Danny McKenna had cleverly beaten two players on the right wing. Bishop dragged a shot wide after a neat lay-off and Taylor selfishly shot into the side netting when he had better options in the box in a rare moment of home pressure. However, it was Witton who were looking the most likely winners, with Hopley latching on to a long ball forward only to be denied by Breeden, who had wisely chosen to stay in his box on this occasion and the home skipper then pawing away an effort from Owens. Foley headed against the top of the bar and over when the ball was played back in. Taylor nicked possession on the edge of the Albion box only to drag his shot wide and play quickly switched to the other end where Owens looked to have rounded Breeden only for the keeper to throw out an arm and play the ball onto the strker and out for a goal kick. Breeden then produced a fine reaction save to tip the ball over after it was flicked on at close range by Liam Goulding following a Witton free-kick. Despite having seen so many chances go begging, Witton’s faith a winner would come never wavered and Hopley was the next to try his luck, volleying over from inside the box. The visitors were to be proved right though it was Brakes rather then Witton who were the beneficiaries of a deciding goal. Substitute Dwyer picked up possession after Owens was robbed on the touchline and, running across goal, produced an unerring shot from 25 yards which whistled past Hall and into the far corner of the net. Literally floored by the winner, the Witton players were unable to muster a response in the two remaining minutes, leaving Holleran to reflect on a very welcome smash and grab. “It’s happened to us umpteen times this season, conceding late goals,” he said. “It’s not nice, but I’ve been around long enough to know that it happens now and again. Brakes: Leamington: Tony Breeden, Junior English, Connor Gudger, Joe Clarke, Jamie Hood, James Mace, Kieran Dunbar (Ahmed Obeng, 62), Reece Flanagan, Colby Bishop (Anthony Dwyer, 85), Jack Edwards, Connor Taylor. Subs not used: Jack Lane, James Bowen, Callum Gittings. Witton Albion: Greg Hall, Anthony Gardner, Matty Devine, Josh Wardle, River Humphreys, Liam Goulding, Danny McKenna (Michael Wilson, 90), Tom Owens, Cesaire Lingouba, Will Jones (Rob Hopley, 38), James Foley. Subs not used: Will Booth, James Yates, Chris Noone.